You can quickly import documents from window explorer or desktop into Docsvault using the 'Send To' context menu. •Right click on a file or folder you wish to import and select ‘Send To > Docsvault’. •In the Docsvault Navigation dialog that opens up, select the desired location. •Fill up the necessary information in the ‘Import’ dialog and click on Import button. 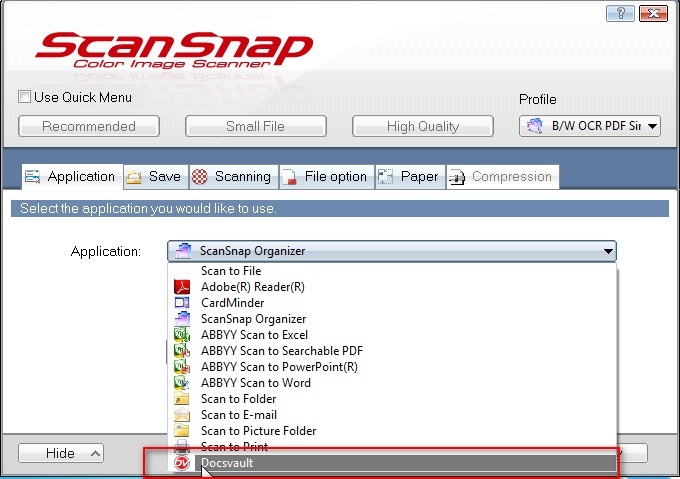 You can use your scanner’s scan buttons to save scanned files directly into Docsvault. Almost all scanner brands have their own application running in the system tray that monitors the scanner and allows users to customize the scan button functionality on their scanner along with many other scan parameters. 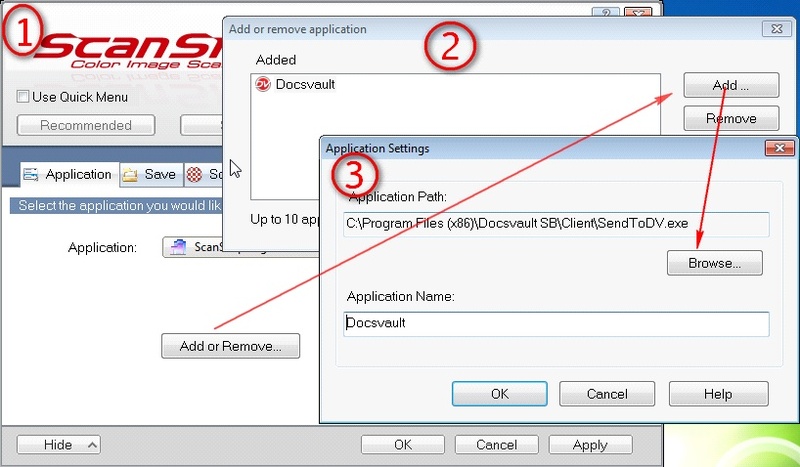 You should be able to set Docsvault’s Send To executable as a destination for your scanned files in your scanner’s application. By default this Send To executable is located at C:\Program Files (x86)\Docsvault <edition>\Client\SendToDV.exe. 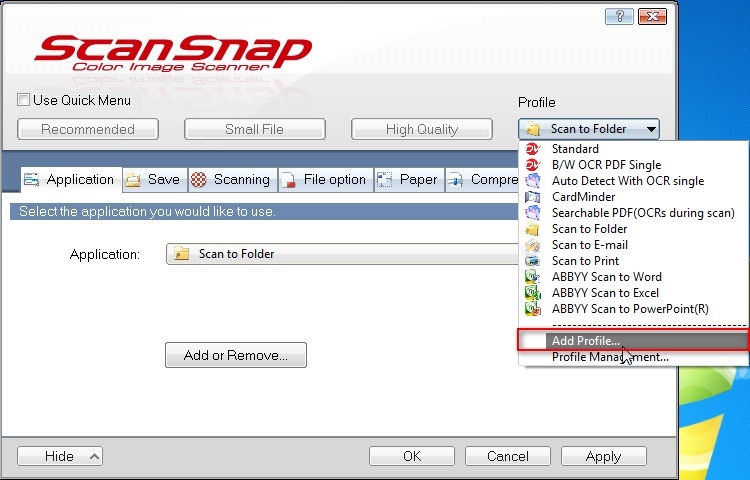 Below we will display an example on how to do this using the Fujitsu ScanSnap scanners. 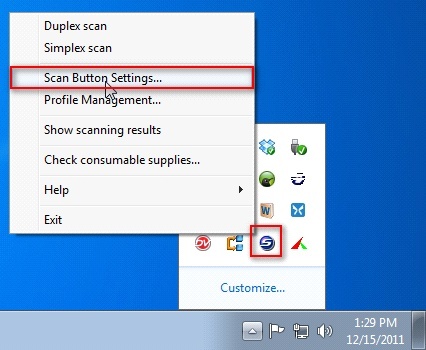 Note that if you have scanner from some other brand your software will have different options but following will help you understand how to set Docsvault as a target application for your scanner. 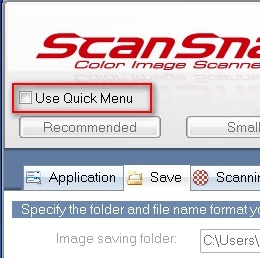 Uncheck the ‘Use Quick Menu’ in the Scan Snap Manager dialog that opens up. This will unlock the “Application” tab which is required for next steps. From now on, when this profile is selected, using your scanner button you will see a Docsvault navigation dialog to import scanned files directly into Docsvault.